OnSite’s Confined Space Rescue & Support Team are specialists when it comes to operating in difficult conditions. With extensive experience of confined space projects worldwide, we can assist with your assessment and management of these projects. We assist you in making the access and egress for personnel and equipment as safe as possible, along with the reassurance of an effective response and rescue service in the event of an emergency. 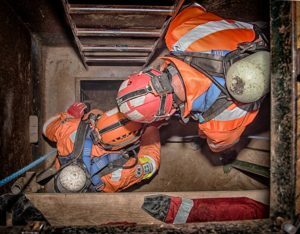 We are specialists in the rescue and recovery of victims trapped within a confined space, or in an area that is only accessible through confined spaces, such as underground vaults, storage tanks and sewers. Confined space rescues can be extremely challenging, not only due to space restrictions but other key factors such as poor visibility and hazardous materials, whether liquid or gas, which can impact significantly on oxygen levels—unless you have the training and equipment you should not enter. Our CSRS team (minimum of three) consists of a team lead who coordinates activities from outside of the confined area and at least two crew members operating within the confined space. Larger teams are often utilised with numbers dependent on the conditions and the nature of the operation. 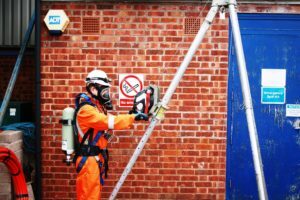 When would you need a confined space rescue team? Confined Space Regulations 1997 (Regulation 5 Emergency arrangements) requires that; no one should enter or work in a confined space unless there are emergency arrangements in place that are appropriate for the level of risk involved in the task/space. 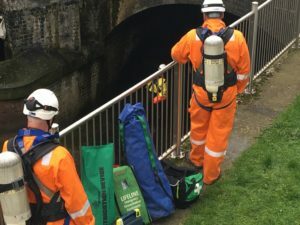 These should include making provision for extracting workers from the confined space and making provision for first-aid equipment (including resuscitation equipment) where the need can be foreseen. 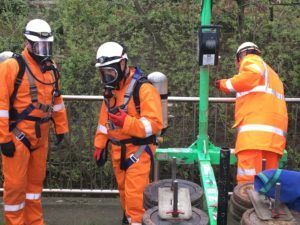 A confined space rescue team would most commonly be required when carrying out works in high risk confined spaces as determined by the risk assessment. If you are unsure as to whether a CSRS team is required, then OnSite will undertake a site risk assessment for you and advise on the safeguards that you need to put in place.